Dawn Wells turns 80 in October, but while she is gifted with what can only be described as ageless beauty, she's had her share of hard times. 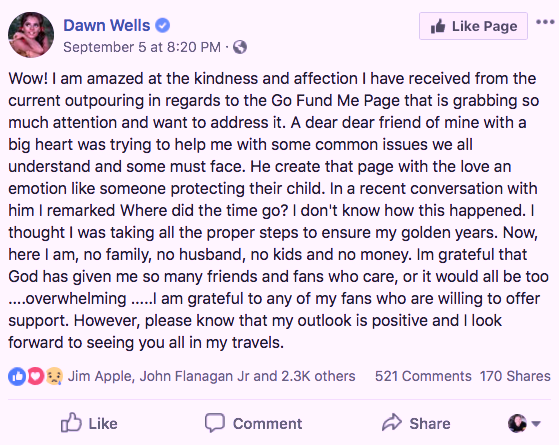 In recent years, Wells reportedly lost her savings and endured what is being called "a life-threatening surgery" for an undisclosed ailment. Now, a friend, Dugg Kirkpatrick, has launched a GoFundMe campaign, seeking to raise a whopping $180,000 on Wells's behalf in order to pay down IRS penalties and her hospital costs. When I first read about this, I thought she'd have no chance ... but the campaign has already raised nearly $140K in just 10 days! Check it out here. Do you think you'll be likely to donate to Dawn? Is it an appropriate use of GoFundMe? It certainly dovetails with the news of Geoffrey Owens bagging groceries between acting gigs. Meeting Dawn Wells in 2018 — Pics HERE! I was honored to meet Ms. Wells again this year, and I must say, the onetime beauty queen is as gracious, bubbly, funny and personable as she is pretty.